Sitting with oars in hand, our 18ft. raft holding 23 days worth of gear begins to pick up speed. All I can do is wait. The roar below is almost deafening, though all I can see from this vantage point is the current in front of us forming into small ripples and then disappearing as they drop off the horizon line. Violent spurts of water shoot straight up into the air beyond in the distance. This is Lava Falls. We drift closer and closer to the entrance as the current moving us faster with each passing second. I take short, choppy strokes with the oars, just trying to keep us on the line I have chosen. There is a strong eddy to my right, and I know that if I allow even the slightest bit of it to touch my boat, it will take us too far right. Just downstream and to the left holds a huge recirculating hydraulic that will flip us instantly if we hit it. There is a fine line, and like every other rapid on the Grand Canyon, it is all about the entrance. It is in this moment when time seems to slow down. It is in these moments when time almost stops. There is nothing else but me and this powerful expression of nature below. My focus becomes so defined and heightened. Everything seems to move in slow motion. In the midst of the surrounding chaos and rush of adrenaline, there is a sense of peace and calm. Over the next few moments, I will taste a tiny piece of what has created this place. It was day 17 of our 23 day trip down the Colorado River through the Grand Canyon, and so far, all of my expectations had been exceeded. Pushing off from Lee’s Ferry on day 1, the sense of excitement and adventure was almost overwhelming. We were entering one of America’s last great wilderness areas. As we drifted out into the current, looking back towards the put-in would be our last sight of a road of any kind for 230 miles. We were a group of 16 river guides who all worked together in West Virginia, and for 280 miles, we would be totally self-sufficient, carrying everything from sleeping bags to satellite phone, tents to toilet. As we made our way deeper into the canyon, we were awestruck by the flowing waters and cascades of Vasey’s Paradise, Thunder River, Elves Chasm, and Deer Creek Falls. We explored and scrambled up side canyons called Nautiloid, Nankoweap, Shinumo, Tapeats, and Blacktail, and we stood in disbelief, staring at the milky blue waters of Havasu and the Little Colorado. All the side hikes and canyons alone would have made for a phenomenal trip, but in addition to all this, there were the rapids. 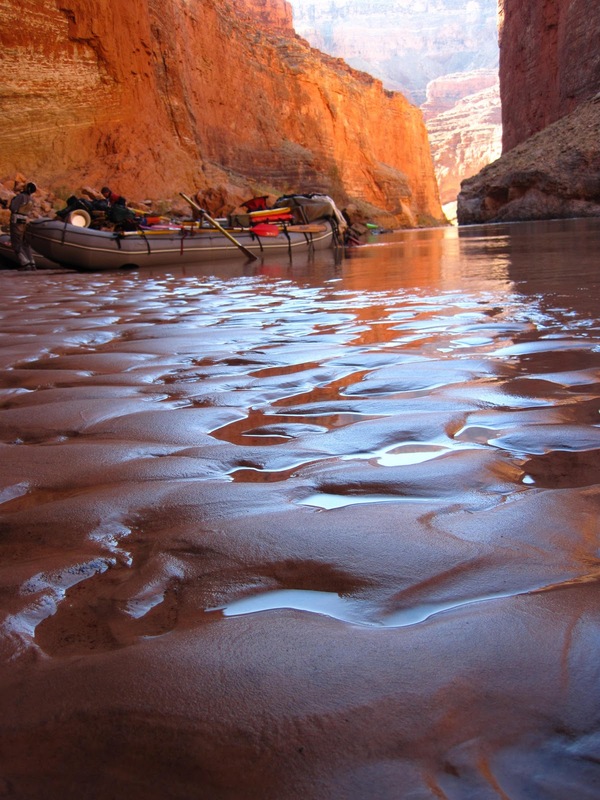 The rapids of the Grand Canyon are some of the most famous in the world. 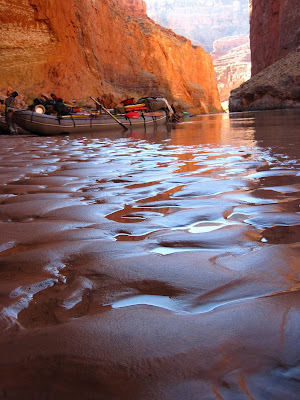 Unlike other rivers that are narrow, steep, and technical, the Colorado river is wide, carrying a large volume of water, and creating rapids with huge, intimidating features. With names like Hance, Horn, Granite, Hermit, and Crystal, they are each beautiful whirling explosions of whitewater. Each has its own dangers to avoid and moves to make. On the ninth day of the trip, we took a layover day just above Crystal Rapid. I spent a large part of the day sitting on the rocky bank staring out at the huge waves and features of the rapid. Strong hydraulics, boiling eddy lines, and waves standing 12ft. from trough to crest. Trying to take in all the dynamics and features was almost overwhelming. I found myself looking at the rapid in both awe and disgust, seeing in it beauty as well as terror. Throughout the years of working on and experiencing different rivers, these interesting contradictions seem to continually present themselves. 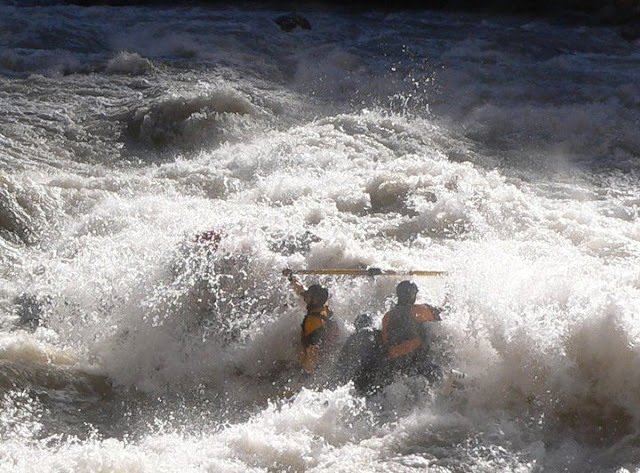 How can whitewater be so beautiful and yet so terrifying? In the midst of such chaos, why is there a sense of peace? How is it that I can feel simultaneously humbled and empowered? All of these contradictions collided in the heart of Lava Falls. Lava Falls is the biggest rapid in the Grand Canyon, and one of the largest raftable rapids in the world. Its features are huge. There is a hydraulic known as the “ledge hole” in the center at the top. Running this would result in a sudden and violent end to your raft being right side up and you being in it. The right side of the rapid is monstrous, consisting of multiple 10 to 16 foot tall standing waves, the infamous “V-wave,” and a rock at the very bottom right known lovingly as the “cheese grader.” The idea is to enter moving from right to left, going just to the right of the “ledge hole” but continuing to move left, missing the “V-wave” and staying away from the “cheese grader.” The difficult thing is that almost all of the current is pushing hard to the right. As you approach the rapid, from the boat you cannot see anything below but horizon line until you are within a few feet of the “Ledge Hole.” Sound like fun? Here’s how it went for us. By us, I mean myself, wife Laura, and our friend Alyson. I took the oars, Laura was coiling our bowline and pushing us off the bank, and Alyson decided to document the run by shooting some video. This was a brave choice, considering that having one hand hold the camera left her with only one hand to hold the boat. As we made our way towards the top of the rapid, I focused on the horizon line created by the “ledge hole” and a tiny bubble line that was moving out from the top of the eddy on the right as I mentioned earlier. That bubble line would lead just to the right of the “ledge hole,” into a 7 to 8 foot standing wave. As we got closer, I saw the wave and began rowing hard straight towards it. Ideally, I wanted to hit it and keep my momentum going left. The roar got louder and louder. As we came to the very top of the rapid, I saw the wave in front of me, the “ledge hole” just off to our left, and the chaotic mess off whitewater beyond. I rowed hard into the wave. When we hit it, I felt like I had run into a brick wall. I was not expecting the wave to pack that much punch. It knocked me back, immediately turned the boat sideways, and sent us to the right, drifting straight for the “V-wave.” As the classic rafting description goes, we lost total control at the top and never recovered. Looking over my right shoulder, I saw the infamous “V-wave” below. The difficult thing about this particular wave is it is literally shaped just like a “V” that is pointing straight downstream. It is actually two separate waves, crashing into each other. So no matter which one you try and hit square with the nose of your boat, you are bound to hit the other one with your side. At this point, I quickly try and pull with my left oar in order to at least bring the tail of the boat around so we do not go in totally sideways . The next few seconds were a blur. As we backed into the heart of the “V-wave,” I remember suddenly being lifted up into the air. The next thing I knew, my feet were above my head and I was diving head first into the middle of Lava Falls Rapid. In the midst of it all, Laura and Alyson, who were sitting directly behind me, are having their own little adventures. When we hit the “V-wave,” Alyson was tossed from the right side of the boat, over the top of Laura, to the left side of the boat, and halfway out of it. Laura had somehow managed to hold on, and when she realized that I was gone, she lunged for the oars to try and gain control of the boat. I am not sure what I grabbed on to, but in an instant I was able to crawl back in the boat. I went to grab the oars, and simultaneously, the three of us must have looked downstream, because in unison we all immediately yelled “High-Side!! !” We were drifting sideways into a 15 foot tall wave right next to the “cheese grader.” We all knew that without our weight on the downstream side of the boat, we would surely flip. All three of us scrambled onto the downstream tube and held on tight. We hit the wave dead sideways. As the boat crested over the top of the wave, it stalled for an instant. I took a deep breath. I thought we were flipping for sure. They say the average run through Lava Falls takes only 20 seconds, but depending on the run, it could be the longest 20 seconds of your life. Nothing could have been more true. For whatever reason, our boat did not flip. Once we came over the top of that last wave, I jumped back in my seat and grabbed the oars. There was still work to be done. We had to get over to the eddy at the bottom right of the rapid. Our boat had gone first, and we need to set safety for the other boats. There were a couple other people who fell out while running Lava that day, but out of our six boats, all stayed upright. Sometimes, that is all you can hope for. Lava Falls humbled me that day. It reminded me of how little control I really have. It is one of those interesting contradictions. When nature’s grandness is on display, I feel content in my obscurity. I am reminded there is no point in seeking to conquer or subdue a river and its rapids, or any aspect of nature for that matter. One should only hope to experience them. Could I ever grow tired of a sunset, that mystical end to each day? Could it ever loose its awe, its peace? The last rays of sunlight making their way across the horizon, lighting up the cliffs facing their descent, shadowing the mountains and mesas in the distance. This earth, pure inspiration to embrace. When God was done, He saw that it was good. I think maybe He underestimated himself. 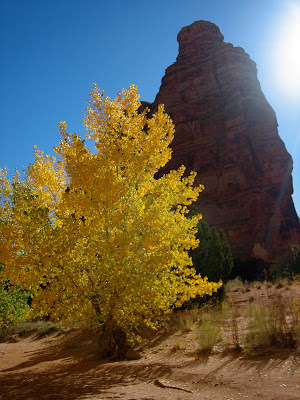 Another picturesque morning, waking up underneath the sprawling arms of a cottonwood, the sun slowly creeping over the horizon of slick rock domes. Down in this canyon, there is still a chill in the air left over from last night, but as the sun’s rays reach my face, I cannot help but want to crawl out of my bag. The morning is so peaceful here, so calm. All I hear are the chirping birds starting their day, and the rustle of leaves as a slight breeze passes through them. 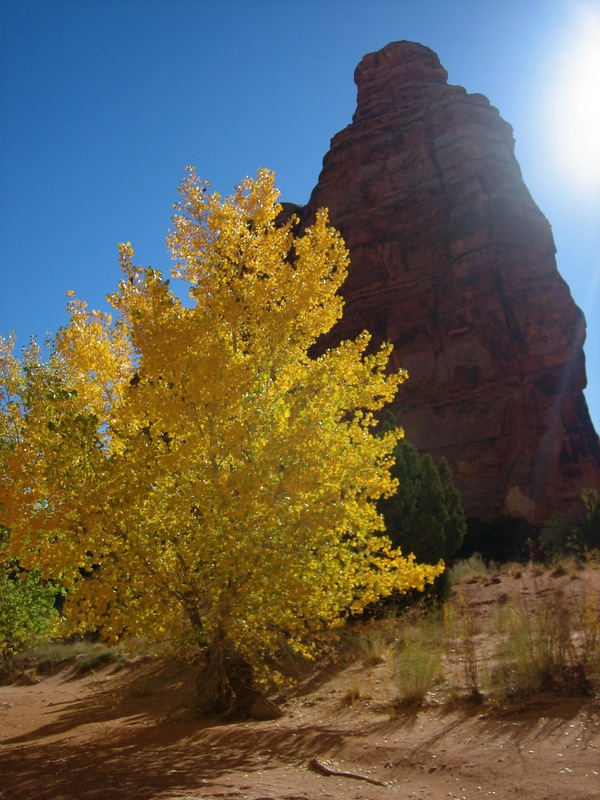 The contrast of their bright, vibrant green against the surrounding red rock is beautiful, pleasing not only to my eyes but to my soul as well. This land of canyons has fascinated and captivated the hearts and minds of many before me, and here I sit as they did, feeling powerless to its draw. The sun slowly slides behind a distant western ridge, its purple, pink, and orange glow still lingering in the evening sky. The colors bleed into one another, making it impossible to discern where one begins and another ends. As I lean back, sitting against the moss covered trunk of a downed tree, I can feel the warmth from the fire on my face. The flames dance from side to side with the ebb and flow of a crisp spring breeze. I take another sip of fresh pressed coffee from my mug, savoring its rich, dark, earthy tones, savoring this moment as well. The stillness is intoxicating. The crackle of the fire, the wind in the trees, and the soothing hoot of a nearby owl all add to the sense of peace that is gently infiltrating my body and mind. I let out a deep, long breathe, my eyes slowly close, and it is as if every muscle in my body exhales with me. 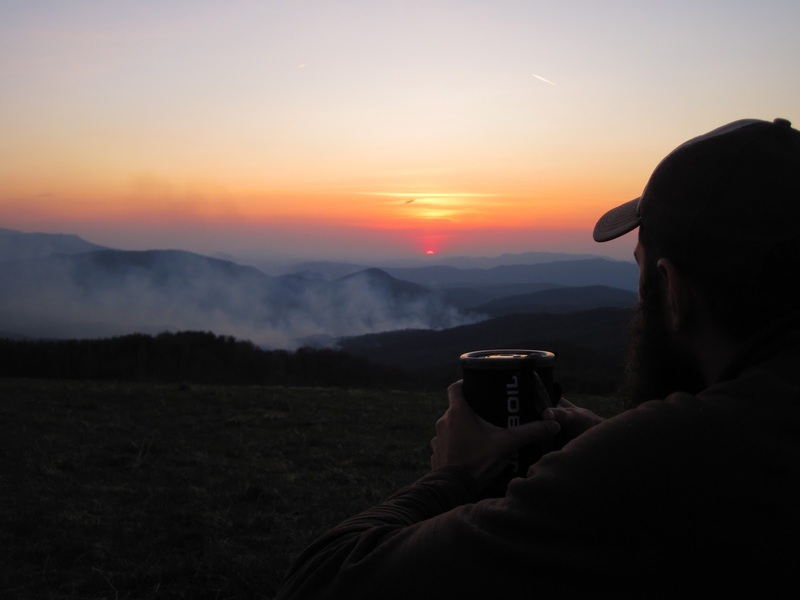 After another sip of coffee, steam rises from the opening in the lid of my mug. My eyes follow it upwards, and I now notice the half full moon directly above me and the handful of stars that have begun making their heavenly positions known. The branches of the trees are raised and outstretched like arms, praising and welcoming the darkening night sky. A better script for the day’s end could not have been written by even the most talented of play writes nor reproduced on the grandest of movie screens. There is no substitute for nature. Creation cannot be outdone. I sit in humble awe. The crackle of the fire, the wind in the trees, and the soothing hoot of a nearby owl. I am blessed to be a witness. It was a crisp, clear Easter morning as we made our way towards US HWY 19 and the Nantahala Outdoor Center. 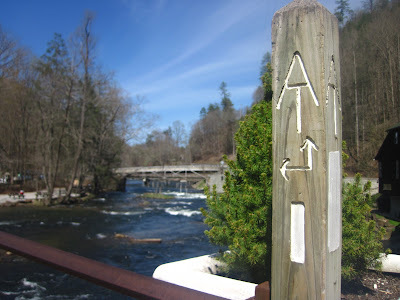 It was day 14 of our thru hike of the Appalachian Trail, and we were looking forward to getting our resupply and spending an afternoon by the Nantahala River. The steep decent from Wesser Bald and “the jumpoff,” as the guidebook described it, had left my knee aching, swollen, and in need of a break. As the few buildings that comprise the N.O.C. came into view, they were accompanied by the rustling yet peaceful sound of the river. The first building we came upon was the Wesser General Store, so we decided to take a look and see what they had in stock. In addition to getting enough food to get ourselves to Fontana Dam where we had a mail drop awaiting us, we were hoping to find a phone card. My wife Lola and I had decided to deactivate both of our cell phones for the first part of the hike, but with it being Easter Sunday, we thought it would be nice to call our parents. I clumsily slid my pack under the table, still completely disheveled. My brain was having such a hard time processing what just happened that it seemingly cut-off signals to my extremities and any dexterity thereof. Did this total stranger just offer us his truck? I was not sure if he was crazier for offering or if we were crazier for accepting. As we made our way out the front door, still unsure if this was really happening, Hank motioned to his white Chevy S10 and loving added, “Just be gentle when puttin’ her into first. She can be a little tricky.” I pressed down on the clutch and turned the key in the ignition. Had I been blindfolded, I would have thought I started a monster truck. The engine roared, the muffler backfired, and the entire truck shook like a dog at the front door ready to go for a walk. Lola and I looked at each other and couldn’t help but smile from ear to ear. We made it up to the gas station, the truck roaring and backfiring the entire way. We picked up a few things, but never were able to find any phone cards. As we got back in the truck, I fired her up and was about to head back down the road to Hank and the Wesser General Store when I noticed a man slowly walking on the sidewalk in front of us. As he walked by, he never stopped looking at me, and he was grinning, like he knew something that I did not. He made his way past the front of the truck and then stopped, raised his hand to wave, and yelled over the sound of the muffler, “Hank let you borrow his truck, huh?” I smiled, waved, and nodded in agreement. We were not the first hikers to experience Hank’s generosity, and I am sure we will not be the last. We were spending the day hiking in the Cranberry Wilderness, a 35,500 acre section of the much larger 901,000 acre Monongahela National Forest. The Cranberry is but one of many little-known jewels of the natural world that Laura and I have had the opportunity to explore and experience during our time spent in the great state of West Virginia. Rugged mountains, thick forests of beech, poplar, maples, and rhododendron, and the melodic trickle of crystal clear streams all add to the beauty and allure of this slice of Appalachia at its finest. Today we were embarking on a loop hike, first making our way west down the Big Beechy Trail to its intersection with the Middle Fork Trail, where we would then head back southeast following along the banks of the Middle Fork of the Williams River, climbing with it to its headwaters. The hike had been great so far. For the first few hours, we had been engulfed by a thick fog, giving the forest an eerie, ghostly feel. We hiked through blankets of ferns and tunnels of blooming rhododendron. More than 900 species of flora have been identified in the area. Along rocky ridges there were gnarled and twisted trees, with their exposed roots desperately grasping to the earth providing evidence of powerful winds and storms sure to return. By the time we made it to the intersection with the Middle Fork Trail, the skies seemed to be clearing. Sunlight was beginning to make its way through the thick canopy above, awaking some of the 80 different species of birds surrounding us with their music. We discovered a small waterfall at the confluence of Big Beechy Run and the Middle Fork of the Williams River, both of us voicing our desire to come back and spend a night at this spot sometime soon. Our conversation slowly tapered off, as it often does when we hike together. One of my favorite things about hiking with Laura is the balance we have of great discussion along with time to simply soak in our surroundings. Both of us have discovered the need and value to stop talking, and allow ourselves to hear from nature. We kept hiking, Laura still behind me, and I decided it was time. I slowly turned. As I made my way around, now facing back towards the way we came, I deliberately looked over Laura’s shoulder, back down the trail. As I did, I allowed my eyes become large, dropping my jaw, and as I began shuffling to run I let out an “Oh God!” This rapidly sent Laura into a frenzy, and, even though there was nothing behind her, she quickly decided that verification was not something she needed at that point. Looking back, I can not help but laugh. There is no doubt that what I did was mean and childish. I will not even attempt to defend myself, but the look on her face was absolutely priceless. Within seconds, I was bursting with laughter, grabbing to hug Laura, and she was realizing this was but another encounter with my maturity level. She quickly pushed me away and let me know of the newly enforced time limit. All in all, the punishment fit the crime. Just before the bear made it’s descent, there was a moment when, I swear, the bear looked down as I was looking up, and our eyes locked. It was only for an instant, but in that instant, that fleeting fraction of a second, I was overcome with a complete sense of humility and powerlessness. There was absolutely nothing I could do, no way for me to control what was about to take place. In a flash, the bear was making it’s way back down the trunk of the tree, and as soon as it’s paws touched the ground, it bolted a few feet in front of us, down the embankment, and a quickly across the flowing stream, disappearing into the thick woods before either of us could blink. Just as abruptly as it had begun, our encounter was over. Needless to say, the remainder of our hike was “hyper-attentive.” I do not know that I can ever recall a time when my ears were more in tune to every crackle and rustle. As we think back about past adventures and tell share stories with friends and family, Laura and I often revisit and relive this hike in the Cranberry. It is always good for a few laughs, and as most stories go, in the end, one of the characters get precisely what they deserve. In this tale, that character being me, deservedly having the piss scared out of me after maliciously doing the same to Laura. Upon reflection though, on a slightly more serious, introspective note, I cannot help but think back to that moment of humility. Looking into that bears eyes and realizing that ultimately, what would happen next was totally up to him (or her, since, in the hectic pace of events, I never got the chance to, well, you know.) When speaking of the natural world, I more often than not hear people use phrases like “survival of the fittest,” refer to it as “the predatory jungle,” or site the rule “kill be killed.” There is this notion or assumption that life in nature is a constant struggle for survival, but through this experience and others since, I have come to realize more and more how much grace abounds in nature. In nature, the act of giving is held in high regard. By grace, the clouds give rain to the plants and rivers. By grace, the plants give themselves and their fruit as food to the animals, and the animals, in death, give the plants and the earth back their nutrients. By grace, that bear did not maul me or my wife. True, in nature, there are consequences, and some times those consequences even result in death, but what I continue to ponder is the even truer and more profound a realization that nature could not exists without grace. I roll over to my side, half asleep, eyes still closed, but I can feel that the morning sunlight has made its way to my face, nudging me, calling me to get out of my sleeping bag. A new day is here, and as I slowly begin to open my eyes and enjoy the first stretch , twist, and yawn of the early morning, I can feel the lingering effects of the day before. The arches and pads of my feet ache, my calves are tight, and my knee is slightly swollen. I turn my head to the side , looking at Laura asleep next to me. I know she's felt that first ray of sunlight as well, but I also know how she likes to deny its call for five more minutes. I ask her in a soft voice, "How'd you sleep?" and she answers, eyes remaining closed, "Still sleeping." Her reply always causes me to grin. This morning, like every other morning on the trail, will be consumed with packing. As a fellow hiker once told me, "It doesn't matter if you're hiking 20 miles or 2 miles, it still takes the same amount of time to load your pack." I begin with my sleeping bag, mashing it into its proper stuff sack and putting it into its place on the bottom of the pack. Next in are my spare clothes: a fleece, pair of shorts, socks, and a shirt. I leave my rain gear out for mow; always better to keep it easily accessible. I grab any food I might want during the hike and place it in the top compartment where it's readily available. The rest goes back into the food bag and sits on top of the spare clothing, next to the cookware, stove, and fuel. The tarp and hammock complete the ensemble. I pull the drawcord tight and snap down the top compartment. While making a quick scan to ensure nothing is left behind, I strap my sleeping pad and sandals to the outside of my pack. As I lift it up with both hands and swing it quickly to the side, all in the same motion I maneuver my right arm through the corresponding shoulder strap. My left arms shortly follows suite. Everything I have is on my back. Another day on the trail is unfolding. As I shift my weight and lean forward to adjust the waist belt, I think about the day ahead, about what I will do, about what I will accomplish. Some may think not much. After all, there are a number of things I will NOT be doing today. I will not go to work. I will earn no money. Today, I won't do anything that has any economic value what-so-ever. I will not drive a car or read a news paper. Today there will be no phone calls, text messages, or emails. I won't even manage to flush a toilet. So then, what will I do today? Well, I will walk. 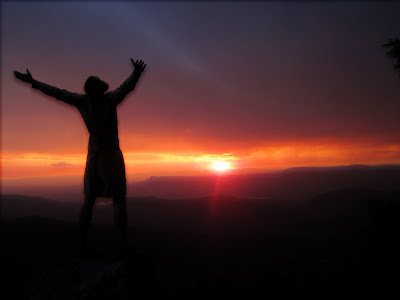 I will walk up one side of a mountain and walk down the other side, only to go up and back down the mountain after that. Today I will struggle. I will sweat and become short of breath. I will trip over roots and stumble over rocks and somehow find a way to form a new blister on the only unblistered part of my foot. Today I will think. Today I will let my mind wander. Today I will pray prayers of thanksgiving: for people, for blessings, and for this place that I find myself getting to experience right now. Today I will foster connections: with my wife, with myself, with creation, and with my creator. Today I will walk. Today I will live out a dream. As I make the final adjustments to my pack, I look over to Laura and sarcastically ask, "So, you wanna go on a walk today?" The question has become part of the morning's routine, one of us asking the other every day for the past 500 miles. She makes eye contact with me, nonchalantly shrugs her shoulders, and says "Sure. Where should we walk to?" "I don't know, how 'bout north," I respond as we both begin to smile. She agrees, and so the day begins. Today we walk and think and sweat and stumble. Today we connect. Today we live out our dream.